The New York Central is where the Hudson locomotive was designed and tested. It's development was due to the increase in passenger business on the NYC. In the mid 1920s longer trains were required and the existing motive power could not handle more than 12 cars. There was a need for a passenger locomotive which had the capability of pulling 16 to 18 cars. In 1926, the new chief mechanical engineer, Paul Kiefer, designed a 4-6-4 locomotive that had greater starting tractive effort and the ability not only of pulling longer trains but also of maintain higher speeds. So successful was this new design that 275 Hudsons were built for the NYC system including its wholly owned subsidiaries. Of the 275 Hudsons, 30 were used on the Michigan Central, 30 went to the CCC&StL, 20 went to the Boston & Albany and 195 were used on the NYC. Only 10 were built by the Lima Locomotive Works. The balance were built by the American Locomotive Company. The first Hudson arrived on 2/14/27 and the last in 1938. The NYC numbered them in consecutive order starting at 5200 and even renumbered the ones on its subsidiaries so that there was an unbroken string of numbers that reached 5474. All 275 NYC Hudsons had boosters. Of the 275 Hudsons in the fleet, 13 were streamlined. Number 5344 was the world's first streamlined locomotive having had its shroud installed in 1934. The "bathtub" shroud was designed by the Case School of Science in Cleveland, OH. In 1935 it was assigned to the 20th Century Limited between Toledo and Chicago and remained in this service for some time. During July, 1939, this locomotive was re- shrouded to look like the 20th Century J3s. After an October, 1945 grade crossing accident with a sand truck in East Chicago, all the streamlining was removed. Another "claim to fame" of this locomotive is that it was the prototype for the Lionel O-gauge model. Numbers 5426 and 5429, both Class J-3s were streamlined with a stainless steel cowling to match the "Empire State Express" train. This cowling was removed in 1950. Ten of the Class J-3 Hudsons numbers 5445 through 5454 were built streamlined in 1938. The design was created by Henry Dreyfuss and styled to match the new cars of the New York - Chicago "Twentieth Century Limited" which was America's most famous luxury train. After 1945, the stainless steel shrouds were removed. From the very first Hudson, number 5200, there were many design improvements. The Class J-1s had five different design levels. Class J-2 had three. The final Class of Hudsons (J-3) were vastly different from the previous classes and were constantly being improved. The NYC was the pioneer of the 4-6-4 wheel arrangement and ultimately used nearly 56% of all the Hudsons ever produced. Many consider the Hudson to have been the most beautiful steam locomotive ever built. Unfortunately, the NYC did not save even one for posterity. In 1948 two J-1 NYC Hudsons (5311 and 5313) were sold to the Toronto, Hamilton & Buffalo where they became 501 and 502. In 1954, when the TH&B dieselized, both Hudsons were scrapped. Howerver, 5313's tender was retained and outfitted with a steam generator for use on TH&B passenger trains. Tender 5313 survives to this day at Steamtown. It is the largest extant single piece of a NYC Hudson. The Boston & Albany purchased twenty Hudsons, ten from the American Locomotive Company and ten from the Lima Locomotive Works. These locomotives were bought in three orders: one in 1928 for five Class J-2a (road numbers 600 through 604) from ALCO, a second in 1930, for five Class J-2b (road numbers 605 through 609) also from ALCO and a third in 1931, for ten Class J-2c (road numbers 610 through 619) from Lima. 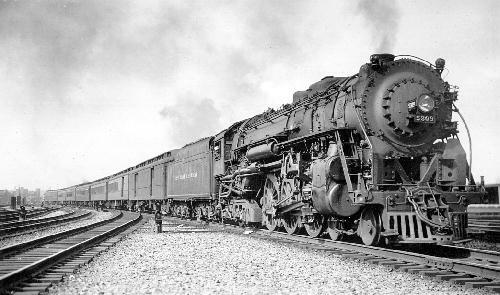 These 4-6-4s were very similar to all the other NYC system Hudsons and they had 25 x 28 cylinders, 75" drivers, a 240 psi boiler pressure (later reduced to 225 psi) and exerted 47,600 lbs of tractive effort. On the NYC System roster, these 20 locomotives carried numbers 5455 through 5474. The Michigan Central Railroad purchased 30 Hudsons from the American Locomotive Company in three orders. Ten Class J-1bs in 1927 (road numbers 8200 through 8209), five Class J-1cs in 1929 (road numbers 8210 through 8214) and 15 Class J-1ds in 1930 (road numbers 8215 through 8229). Later, the NYC renumbered them 5345 through 5374. The CCC&StL Railroad purchased a total of 30 Hudsons from the American Locomotive Works in two orders. The first 20 Class J-1ds in 1929 (road numbers 6600 through 6619) and last 10 Class J-1es in 1931 (road numbers 6620 through 6629). Later, the NYC renumbered them 5375 through 5404. Data from NYC 1 - 1944 Locomotive Diagrams supplied in May 2005 by Allen Stanley from his extensive Rail Data Exchange collection; and from tables in 1930 Locomotive Cyclopedia. (Many thanks to Chris Hohl for his 22 September 2017 email reporting unlikely boiler pressure values for 177 entries. A Locobase macro caused the error.) Works numbers were 67604 in July 1928, 67605-67608 in August and 68482-68486 in August 1930. Boiler had Coffin feedwater heater, valve motion with limited cutoff of 14" (356 mm) piston valves. These engines, built for the New York Central subsidiary, were virtually identical to the NYC J-series Hudsons. A visible difference was the B&A square sand dome. This is the first set of ten, delivered by Alco. Locobase 5873 has the Lima 10, which had slightly less superheating surface. Data from NYC 1 - 1944 Locomotive Diagrams supplied in May 2005 by Allen Stanley from his extensive Rail Data Exchange. Works numbers were 7574-7583 in April-May 1931. These engines, built for the New York Central subsidiary by Alco-Schenectady (1st 10) and Lima (last 10), were virtually identical to the NYC J-series Hudsons. Boiler had Coffin feedwater heater, valve motion limited cutoff of 14" (356 mm) piston valves. A visible difference was the B&A square sand dome and the smaller drivers, the latter in recognition of the Berkshire grades. Later, they trailed much heavier tenders that weighed 280,700 lb (127,324 kg) carrying 12,500 US gallons (47,313 litres) of water and coal weighing 24 tons (21,772 kg). As mainline express power shifted to EMD diesels, the J-2s were transferred to suburban service. J1b 67432-67453 in September; 67454-67475 in October; 67476-67480 in November. J1c 67712-67720, 67722-67729 in December 1928; 67721, 67730-67736 in January 1929. 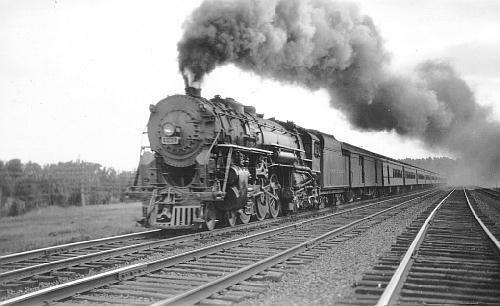 J1d 68153-68159 in November 1929; 68160-68172 in December; 68173-68189 in January 1930; 68190-68192 in February. Boiler had Elesco feedwater heater except as noted below. These were the predecessors to the better-known J3 class. Michigan Central and the Big Four each received thirty of the type. Their tonnage rating was 1,270 tons on the flat at an average speed of 55 mph (89 km/h). Although the engines came in five batches (see below), they had essentially the same dimensions. Firebox heating surface included 37 sq ft (3.45 sq m) of arch tubes. Steam was admitted to the cylinders through 14" (356 mm) piston valves. gallons (38,750 litres) of water and 17 tons(15.45 metric tonnes) of coal. fitted with Coffin feedwater heaters. tonnes of coal and 14,000 US gallons (52,990 litres) of water. It weighed 135,200 lb (61,326 kg) empty and 306,400 lb (138,981 kg) loaded. gear. 5316-5338, 5340-5344 fitted with Coffin feedwater heaters. The cylinder proportions were more equal than in later locomotives and boiler pressure was relatively low. The 5200's low BDF of 519 indicated the design's growth potential. Some J1es assigned to the Water-Level Route premium passenger runs trailed very large tenders that weighed 155,700 lb (70,624 kg) empty and 380,700 lb (172,683 kg) loaded with coal and water. So equipped, the tractive system (engine and tender) came to 739,300 lb (335,341 kg). Chris Hohl pointed out that the engines had 10,900 lb (4,944 kg) ITE trailing truck boosters. S. Kip Farrington dissented boldly from the usual encomiums directed at this design in his Railroading Coast to Coast (1976, p 4). "Readers might be surprised to know that I put the very popular and the pioneer Hudson type, New York Central's J classes at the bottom of the list. They had many more troubles with them than were ever made public, although they did lead the parade." #5311, 5313 went to the Toronto, Hamilton & Buffalo in 1948 as 501-502, where they ran until scrapped in 1954. Data from NYC 1 - 1946 Locomotive Diagrams supplied in May 2005 by Allen Stanley. Locobase 185 is the main entry for this large class of NYC Hudsons. The present record shows the locomotives whose firebox was later retrofitted with 90 sq ft (8.35 sq m) of thermic syphons at the expense of 18.5 sq ft (1.7 sq m) of arch tubes. They also received more superheating surface area. valve motion set for limited cutoff of 14" (356 mm) piston valves. 5344 was the first NYC engine to be streamlined and, as Chris Hohl and Ashleigh Popp noted, was the only New York Central engine to be streamlined twice. She headed the Commodore Vanderbilt beginning in 1935 after being fitted with the notorious "upside down bathtub" streamline casing. Carl Kantola, chief designer of the CV look, reported that wind tunnel tests showed a head-end drag reduction of 30% at simulated speeds of 60-80 mph..
5344 was a pioneer in other ways. She was fitted with solid driving wheel centers in September 1935. Timken roller-bearing main and side rods and lightweight reciprocating parts went on at the same time and were the first to be installed on the New York Central. Valve motion was set for limited cutoff of 14" (356 mm) piston valves. Kantola also noted that 5344 received a new Dreyfus-like streamline look in 1938. Ashleigh Popp noticed that the engine's specs had changed as well with the reduction of the cylinder diameter by 1 1/2". Apparently, the railroad used a J1 boiler pressed to a higher level. 5344 also lacked the thermic syphons fitted in several other J class Hudsons. Data from NYC 1 - 1944 and NYC 1 - 1946 Locomotive Diagrams supplied in May 2005 by Allen Stanley. (Many thanks to Chris Hohl for his 22 September 2017 email reporting unlikely boiler pressure values for 177 entries. A Locobase macro caused the error.) Works numbers were 68839-68848 in September 1937; 68849-68869 in October; 68870-68876 in November; 68877-68878 in December. Almost all of this class used Elesco feedwater heaters: 5406, 5411, 5418, 5420, 5428, 5430, 5435-5436, 5441, and 5444 were fitted with Worthingtons. Firebox heating surface included 37 sq ft (3.45 sq m) of arch tubes as well as that supplied by the combustion chamber. The latter feature was relatively uncommon in New York Central engines. Compared to the earlier J-1, the J-3 had less heating surface but a higher boiler pressure. According to Alvin Staufer (Steam Power of the New York Central System, 1961), the initial pressure setting of 275 psi (19 bar) led to the bending of main rods, so it was lowered by 10 psi. Roller bearings were mounted on all engine and tender wheels. Like the earlier New York Central Hudsons, these had 14" (356 mm) piston valves to supply steam to the cylinders. Both had low BDF and GDF, suggesting an easy-to-work locomotive, a conclusion reinforced by the high degree of superheat. The J3s, however, developed 20% more power than did the J-1s at 65 mph. Their tonnnage ratings included 1,130 tons at 59 mph (95 km/h). Moreover, they could run 185,000 to 200,000 miles (297,850 km to 322,000 km) between shoppings for heavy repairs, which equates to approximately 2 years of service. Such high service levels came also from a variety of large tenders. The heaviest weighed 169,300 lb (76,793 kg) empty and 401,100 lb (181,936 kg) loaded, bringing the total system (engine and tender) weight to 766,600 lb (347,679 kg). The last ten locomotives were completed with the famous Dreyfuss streamlined casing; see Locobase 15868. Data from NYC 1 - 1944 and NYC 1 - 1946 Locomotive Diagrams supplied in May 2005 by Allen Stanley. See also Stephen Drucker, " A Train of Thought:The unforgettable 20th Century Limited and Its Creator, Henry Dreyfuss," Architectural Digest (May 2003), archived at , last accessed 10 October 2003. (Thanks to Chris Hohl for his 2 June 2015 email noting that the original tenders for these engines were the same as those supplied to other J-3s.) Works numbers were 68879-68882 in March 1938; 68883-68888 in April. "Dreyfuss worked with almost pathological restraint, transcending the mindless fashion for streamlining, mixing images of the Machine Age and the Stork Club as only he could. The Century's steam locomotive wore a shroud often compared to a Spartan warrior's helmet, its six huge driving wheels pierced with holes and painted aluminum to attract the eye; and at night the churning wheels were lighted. Dreyfuss understood that his locomotive, which would become one of the most photographed symbols of the era, created drama enough. The rest of the exterior was simplicity itself. It had all the self-assurance of a well-cut gray flannel suit, with blue chalk stripes and a Moderne tail sign glowing blue as it retreated up the Hudson River." A Dreyfuss touch for the interior of some of the 90 cars that also made up the 20th Century Limited was the inclusion of a speedometer in the club car. "Seeing the needle hit 85 miles per hour," Drucker writes,"gave passengers the same thrill they would get, four decades later, watching a digital readout on Concorde [supersonic airliner] as it passed through Mach 1." Chris Hohl correctly states that the first tenders behind this class were the same as those pulled by the other 40 J-3As. They carried 13,600 US gallons of water and and 28 tons of coal. Locobase chose instead to show the enormous PT-1 tenders assigned to the class by 1944; the much greater capacity, in combination with track troughs meant that refueling the PT tenders happened just once along the way from the beginning of steam territory at Harmon, NY to the Limited's arrival in Chicago 15 1/2 to 16 hours later. With the exception of 5450, the Dreyfuss engines retained their streamlining throughout World War Two. The rest shed their ornamental shrouds beginning in March 1946 and ending in December 1947. Including 5450, which had suffered a boiler explosion in September 1943, the entire J3a stud operated into the mid-1950s. Other leading promoters of the streamline age adopted the New York Central's premier passenger power to showcase their products. The Edward G Budd Company of Philadelphia shrouded J3as 5426 and 5429 assigned to the new Empire State Express in 1941 in casings that included their trademark fluted stainless steel in the valences over the rear truck. Similar stainless steel sheathing was applied to the tenders and the 32 cars.